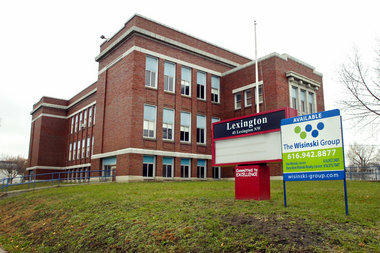 MLive.com – Grand Rapids officials say a deal approved Tuesday will deed to the city parkland at the old Lexington school and two other former school sites, regardless of how they get redeveloped. GRAND RAPIDS, MI â A messy process that left Grand Rapids leaders feeling betrayed over a developer’s switcheroo also has produced an outcome that, if not justifies the means, at least benefits three city neighborhoods, elected officials said. After discussion that included barbs at the Grand Rapids Board of Education and a frustrated rebuke of the deputy city manager, Grand Rapids City Commission voted 5-1 Tuesday to amend a Brownfield deal for redevelopment of the former Oakdale School as a National Heritage Academies charter school instead of the apartments previously proposed. The commission also inked an escrow agreement that will deed parkland to the city at two other former GRPS schools: Eastern, 758 Eastern Ave. NE, and Lexington, 45 Lexington Ave. NW. “I think all of us felt betrayed (when the land was sold to NHA),” Second Ward Commissioner Rosalynn Bliss said. But she and her colleagues, except Mayor George Heartwell, voted to approve the documents that will deed three small pieces of parkland to the city. “Securing those spaces for the future of our city is really important,” Bliss said. Looking to generate revenue to pay off old debt, GRPS agreed to sell four former schools to Ojibway Development. The developer, Bruce Michael, proposed low-income apartments at the sites. But after buying three of the schools, Ojibway re-sold the properties to National Heritage Academies. Commissioners at a hearing Tuesday took their shots at Ojibway. Third Ward Commissioner Elias Lumpkins called the transaction “unethical,” and First Ward Commissioner Walt Gutowski labeled it “deceitful.” But they both pointed to the “greater good,” as Gutowski said, of having the vacant Oakdale school building occupied. NHA plans this fall plans to open a charter school at the Oakdale site, 944 Evergreen St. SE. River City Scholars Charter Academy initially will serve a projected 500 students in grades K-5, then will add a grade each year through eighth grade and eventually serve more than 700 students. But because of the charter school’s auto-oriented model, some of the green space at Oakdale will be paved and less land – about one acre instead of three acres, as proposed under the apartment plan – will be deeded to the city. Still, a school will be better for the Oakdale neighborhood than apartments, said Jeff Chamberlain, an NHA real estate manager. “At the end of all this, look where we are,” he said. Chamberlain said NHA “wanted the (Oakdale) property and sought out Ojibway” after the Berkley, Mich. developer signed a purchase agreement with GRPS last year. The deal included a common non-disclosure clause that kept the charter-school operator’s interest in the land quiet, he said. Heartwell, who lashed out at Ojibway after the developer sold the land to NHA, said the process involved “a breach of trust” with the “flaky” developer that he would not support, even if neighborhoods would benefit from the deeded parkland. Ojibway sold all three GRPS schools to NHA – perhaps to meet the charter school operator’s timeline for opening a campus at Oakdale this fall, while the developer puts together financing for planned apartments at Eastern and Lexington. That deal includes a repurchase agreement that will sell the schools back to Ojibway. A deal for Ojibway to buy a fourth GRPS school, the former Stocking Elementary at 863 Seventh St. NW, was scrapped earlier this month by the school board. Michael has told MLive.com he still plans to develop the Eastern and Lexington schools into apartments, apparently in partnership with Detroit Affordable Homes, Inc., which is a signatory to the escrow arrangement approved Tuesday. It’s not clear whether development of Stocking School was needed to make Michael’s complex financing package viable. If the Eastern and Lexington building donât get converted to apartments, there would be no Brownfield redevelopment tax revenues to capture and the city could be left to fund development of the deeded parkland on its own. Discussion Tuesday included lament that NHA will open a charter school in the city. There also was criticism of how GRPS handled sale of the schools, with First Ward Commissioner Dave Shaffer suggesting the school board failed to thoroughly vet Ojibway’s plans. And Heartwell chastised Eric DeLong, deputy city manager, for adding the escrow agreement to the agenda with little notice, though others lauded DeLong’s work.